Now you can have a full range of capabilities in a digital scale that meets your budget, making parcel control affordable. 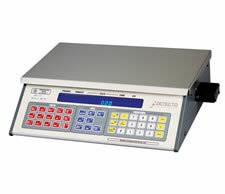 The Detecto MS Series comes in a variety of capacities listed below to suit your needs. Detecto’s MS Series Shipping Scales fully support all USPS and UPS postage rates; provide zip-to-zone conversion, and manual weight entry. With a color-coded numeric keypad that’s easy to use and to clean, these units also feature an easily replaceable postal rate cartridge. Calculations and zone charts are a thing of the past, just push a button and let Detecto do the work for you!